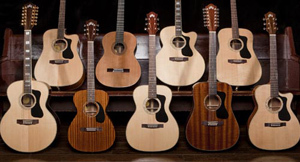 Guitarists such as David Gilmour and Bonnie Raitt have long recognized that Guild acoustic guitars offer great sound and workmanship at reasonable prices. Now Guild has announced the all-new Guild Acoustic Design (GAD) series, which includes the latest in modern, performance-driven features in 19 new guitars. GAD series guitars feature all-solid tonewoods, dovetail neck joint construction, and player-friendly features such as a slim, satin-finish necks for smooth feel and effortless playability. The series consists of many different body styles, including Dreadnought, Classical, Concert, and the all-new Orchestra and Jumbo models with cutaways. Additionally, there are six- and 12-string models available in both acoustic and acoustic/electric versions featuring Fishman® electronics. Inspired by the classic jumbo guitars Guild is long famous for, the F-150R model is a full-bodied acoustic masterpiece with a solid spruce top and solid rosewood back and sides that deliver rich, powerful sound and exceptional volume. Other features include a rosewood fingerboard and bridge, ivoroid body and neck binding, and mother-of-pearl block inlays. It is also available as the F-150RCE, which additionally features a soft, Venetian-style cutaway and Fishman® pickup system. With the F-130CE and F-130RCE, the series offers two orchestra style acoustic/electric models that feature a 1 ¾” nut, rosewood fingerboard and bridge, ivoroid binding, mother-of-pearl rosette and inlays, and Fishman® pickup system. The F-130CE’s solid mahogany back and sides deliver a strong, articulate voice, while the F-130RCE’s solid rosewood back and sides produce a rich, complex sound with warm bass and clear mids and highs making them ideal for a wide range of styles and performance applications. The D-125 dreadnought and its 12-string sibling, the D-125-12, feature all-mahogany construction with a slim, satin-finish mahogany neck, rosewood fingerboard, bridge, and head cap. Both models produce a unique and well-balanced sound with a clear, tight bass and a warm, airy top end that make them versatile instruments that are great for a broad range of musical styles. Guild Acoustic Design Series instruments are available through authorized Guild dealers for manufacturer’s suggested retail prices ranging from $739.99 – $1,829.99. For more information, visit www.guildguitars.com.